Natural Health Supplements Market Segmented By Product Type – Tablets, Capsules, Softgels; Source – Plant, Marine, Others; Application - Digestive Support - Bone & Joint Support, Weight Management, Heart Health, Stress & Anxiety, Sports Nutrition, Others; By Sales Channel - Mass Market, Natural and Health Food, Direct Sales; By Demographics – Men, Women, Kids. The latest report by Persistence Market Research titled ‘Natural Health Supplements Market: Global Industry Analysis and Forecast, 2016-2024’ begins with the executive summary that gives an overview of the global natural health supplements market along with a future roadmap coupled with a brief snapshot of the market dynamics. Also, a list of key market players has been given in the executive summary along with important market numbers and key takeaways based on the market taxonomy of the global natural health supplements market. 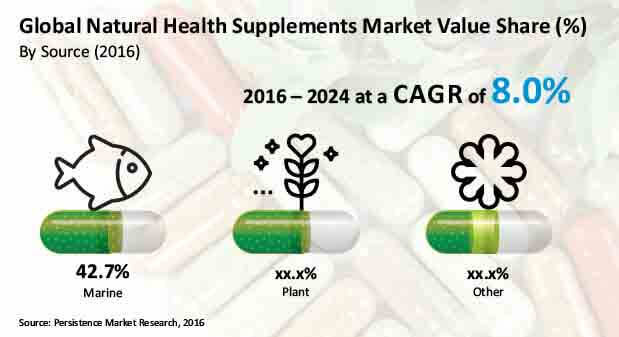 At the end of the executive summary, there is concise information regarding the overall market approach of the key market players, target products in the global natural health supplements market and the differentiation strategy adopted by key market players in order to stand out in the global natural health supplements market. The subsequent section of the report provides an overview of the parent market along with key market definitions of the global natural health supplements market so that there is no confusion in the reader’s mind regarding the scope of the report and what substances are considered as natural health supplements. Also, there is information provided on the safety requirements and the different sales channels of the global natural health supplements market. After this the market taxonomy is provided which divides the global natural health supplements market into product type, source, application, sales channel and demographics. After this section, there is a section devoted to explaining the botanicals that are a source of natural health supplements along with quotes of leading industry representatives. After this, there is a section of the report devoted to explaining in detail the market dynamics of the global natural health supplements market. Market driver impact analysis is provided in the report, which rates the various types of drivers such as economic side, demand side and supply side in various degrees of effect such as high, medium and low. Thereafter, each of the market drivers operating in the global natural health supplements market is explained in detail and then the market restraints are dealt with in the same manner. In addition, opportunities that are available in the global natural health supplements market are also listed, which is followed by the latest trends operating in the natural health supplements market. One valuable aspect of this report is the inclusion of the PESTLE analysis, which talks about various political, economic, social, technological, legal and environmental aspects of the global natural health supplements market and gives detailed explanation of each factor and lists down all the important points sector wise so as to give the readers of the report full comprehension of these factors and how they may influence the global natural health supplements market. Another important aspect of this report is the inclusion of Porter’s Five Force Model that gives important information regarding the global natural health supplements market pertaining to the threat of new entrants, bargaining power of buyers, bargaining power of suppliers and threat of substitutes. In addition, there is an entire section of the report devoted to the explanation of the forecast factors, their relevance and impact and this section also gives ratings for the certainty of assumptions for the factors listed in the report. There is an entire section devoted to explaining the global natural health supplements market policies and regulatory landscape. This section gives information about the various natural health supplements regulatory bodies operating in the world. In addition, there is an entire section devoted to the global natural health supplements market forecast, which contains information about the market size and forecast and the value chain analysis. In the market forecast part, three scenarios are indicated namely, conservative scenario, likely scenario and optimistic scenario and the market size and CAGR for all the three scenarios is given. Besides, there is information regarding the value chain analysis which also gives a list of ingredient manufacturers, product manufacturers and contract label manufacturers operating in the global natural health supplements market. In the subsequent sections of the report, there is information about the global natural health supplements market analysis and forecast by product type, source, application, sales channel and demographics as well as regional analysis. The important aspects covered in these sections are basis point share (BPS) analysis, Y-o-Y growth projections and market attractiveness index. Last but not the least, an important section of the global natural health supplements market report is the competition landscape. This competition landscape lists the major market players operating in the natural health supplements market globally and classifies them as Tier1, Tier2, Tier3 and others. This is an attempt to assess the market share of various players in the global natural health supplements market. The market share is estimated on the basis of sales of natural health supplements across the globe. Besides, there is information provided on the market share each of these companies holds in the global natural health supplements market. Each of the key market players is also featured individually, where important information about them such as company details, company description, geographical presence and information about the financial health of the company is given. A SWOT analysis of each of the key market players is also given along with a strategic overview of the company and also the key developments pertaining to the company. This section is important for both new entrants to the global natural health supplements market and established players, and enables them to study the competition they are likely to face in the global natural health supplements market. Overall market size has been analysed through historical data, primary responses, and public domain data. Revenue of companies in the global natural health supplements market has been benchmarked to ascertain the market size for the base year. Macroeconomic indicators such as GDP have been considered to forecast the market size over the forecast period. The historical growth trend of the end-use industries, market participants’ performance, as well as the present macro-economic outlook has been taken into consideration for estimating the overall market trend forecast. This data is then validated with the help of the triangulation method and is extensively scrutinised using advanced tools to garner quantitative and qualitative insights into the global natural health supplements market. In 2016, the global natural health supplements market was valued at nearly US$ 37 Bn, which is estimated to register a CAGR of 8.0% over the forecast period to reach nearly US$ 70 Bn by the end of 2024. Due to a rapid increase in the prevalence of lifestyle diseases, people are now more inclined towards the concept of preventive healthcare and are adopting a healthier lifestyle. As the consumption of various kinds of health supplements promotes health and improves bodily functions, consumers are getting attracted towards such products. This has led to the increased sales of health supplements directly boosting the market. In addition, the funding of the government towards research on the beneficial effects offered by health supplements is also on a rise. Moreover, there is increased government funding for the ingredients required to manufacture health supplements. All these factors combined are giving an impetus to the development of the global natural health supplements market. The market for natural health supplements has grown tremendously over the recent years globally. The reason for this is the increased health consciousness amongst consumers, and consequently, a shift towards healthy and nutritional food options is being witnessed. Consumers want healthy options that are non-prescribed. Moreover, there is increasing awareness amongst consumers regarding self-diagnosed channels and personalized regime options being offered by various health manufacturers and retailers through multiple online platforms. This is increasing the market for health supplements. In addition, natural health supplements are easily available over the counter. These factors are clearly boosting the growth of the global natural health supplements market. With increasing urbanization and the adoption of modern lifestyle patterns where there is a dearth of time to manage one’s health, there has been a steady increase in the prevalence of lifestyle diseases such as diabetes, obesity and high blood pressure. People have begun realizing the importance of preventive health measures and therefore are drifting towards choices that decrease the negative effects of such lifestyle diseases. Natural health supplements act as a healthy alternative to prevent such diseases. This has led to an explosive growth in the market for natural health supplements globally. Moreover, due to the increasing penetration of the internet, various health magazines and online forums such as Livestrong.com and nutraceuticalworld.com provide vital information to consumers regarding the health benefits associated with the intake of natural health supplements. This has had a positive effect on the global natural health supplements market. As there is no regulation whatsoever on the use of natural health supplements as those for the use of prescribed drugs, the manufacturers of natural health supplements are under no compulsion to prove the safety of their products before they enter the market. This may lead to questions being raised of the efficacy of such preventive health measures. Moreover, there are certain unhealthy consequences being associated with the excessive use of dietary supplements. However, consumers are not aware of such consequences and moreover, there are no warning signals given by the manufacturers of such natural health supplements to consumers. This is negatively influencing the growth of the global natural health supplements market. For example, herbs such as comfrey and kava can cause serious liver disorders if taken excessively. Beta carotene if taken excessively may increase the risk of lung cancer, especially among smokers. Similarly, excessive intake of iron supplements may cause nausea and vomiting and may also cause liver damage. By source, the Marine segment accounted for the highest market share of almost 43% in the global natural health supplements market. This segment is anticipated to register a CAGR of 8.6% over the forecast period and reach a market valuation in excess of US$ 30,300 Mn by the end of 2024. The Marine segment is estimated to create absolute $ opportunity of more than US$ 14,600 Mn between 2016 and 2024. While plant sources have been an ancient source for the extraction of natural ingredients, the Marine source segment is likely to gain momentum during the forecast period. Innovation in drug delivery formats through microencapsulation and nano separation techniques are anticipated to fuel the demand in the softgels drug delivery format among manufacturers. Also, natural ingredients from marine sources and others such as fish oil and propolis are gaining significant traction. Furthermore, considering the varied applications of natural health supplements, weight management and sports nutrition supplements are collectively becoming preferred choices among consumers.